Brillantmont has many talented students, and considers each one special in many different ways. Each year, upon graduating, some are honoured with awards from both Brillantmont and outside organisations. Here we bring you news of two such students – Wei (William) Lee from Taiwan and Ekaterina Dopiro from Russia. The winner of the ECIS (European Council of International Schools) Award of International Understanding was given to graduating student Wei (William Lee) from Taiwan. 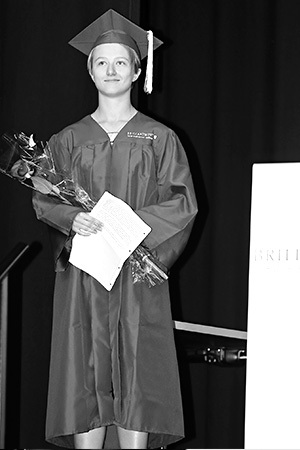 William who studied at Brillantmont for four years was an exemplary student and fully contributed to school life. As House Leader he organised many events and displayed his sportsmanship in the school’s badminton, athletics and swimming teams and ping pong club. He played saxophone at many social events and as part of the school's vocal group. William also acted as « school photographer », gave up his free time to help other students with their maths and helped produce the 2012-2013 yearbook. William was a key player in Habitat for Humanity, joining fundraising activities as well as taking part in building projects in Portugal and Cambodia. With friends from all over the world amongst both day and boarding students and a positive influence on his peers, William was an excellent ambassador for his country. We congratulate him on this award and wish him success for the future. 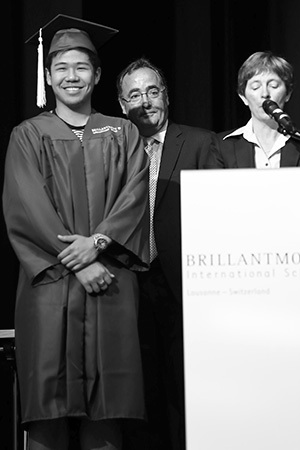 The Brillantmont Prize of Excellence is awarded to the Graduate who has had no failing grade throughout their High School years, been consistently on the school’s Honour Roll, and obtained the best overall academic average for the last two years (11th and 12th Grade). This year's award went to Ekaterina Dopiro from Russia. Ekaterina completed A Levels in Mathematics, Physics and Chemistry, AS Levels in Economics and French and reached an intermediate level in Italian and German. Ekaterina continually set the standard in class and inspired others to learn. Despite a heavy academic programme she still found time to be involved in a range of activities from water polo to astronomy. She is set to become a top university student as she embarks on a degree in Information Science at the top-ranking EPFL (Ecole Polytechnique Fédérale de Lausanne) and we wish her well. This year’s Brillantmont graduates are heading to universities around the world, including the London School of Economics and New York University, while some are staying right here in Switzerland to attend the Ecole Hôtelière de Lausanne and University of Lausanne.